A metamorphic virus can steal your data and demand ransom for the financial benefits. Besides affecting your machines defense mechanism, metamorphic virus can also easily manipulate multiple hosts at the same time. So, let’s understand what is Metamorphic virus, and all you should know about metamorphic virus to detect metamorphic virus. A metamorphic virus is a type of malware that can easily modify its code and signature patterns along with very signal repetition. This virus is slightly advanced which can transform based on the ability to translate and edit. In fact, metamorphic virus is capable of rewriting its own codes. Metamorphic virus is one of the most infectious computer virus that comes with tons of capabilities to damage your system. Antivirus software is not able to detect this virus easily as it changes every time to damage your system and steal your valuable data. A metamorphic virus is different from a polymorphic virus that can conceal the primary and original code to make sure it not detectable or difficult to detect by any antivirus or antimalware software. Malware comprises of an encrypted executable which has virus decryption routine (VDR). When the infected application executes, VDR starts its work of decrypting the encrypted virus body and then the virus works in the way, it is designed. When the malware enters in the propagation stage than the virus becomes re-encrypted and joined to additional host apps. Well, in this process every single copy creates a new key but every time the VDR remains identical. This is the entire process of how antivirus software apps work, detect and eliminate malware programs to avert the attacks. A polymorphic virus is an advanced version of the virus that adds an additional component to the encrypted code called ME (mutation engine). This mutation engine changes the virus decryption routine with every signal repetition by applying the obfuscation practices like reordering instructions, inserting junk code and applying mathematical contrapositives. These are one of the malware and virus that can be identified by antivirus software although the decrypted virus body stays the same constantly. Metamorphic malware is the next generation of virus mutation. To work, polymorphic malware’s ME is used to change VDR and EVB. Wherein, ME dismantles the code and displays it with a meta language which describes function of code. However, it ignores how code completes this function. The resulted code has no similarity to its original Syntax, though the functionality remains the same. Metamorphic Virus has various types of virus which are not easy to detect. However, until now only some of the virus has been identified by experts. One of the powerful virus is called Zmist which is initiated in Russia. This virus was created by the author named Z0mbie. It was exposed in the early 2000s. Virlock is another sub-type of Metamorphic virus, as per the experts this virus is a unique virus that comes with a unique code which assigns different codes to the viruses within the shell and because of it Virlock virus is very hard to detect. One of the biggest threats that metamorphic virus can cause is data loss. 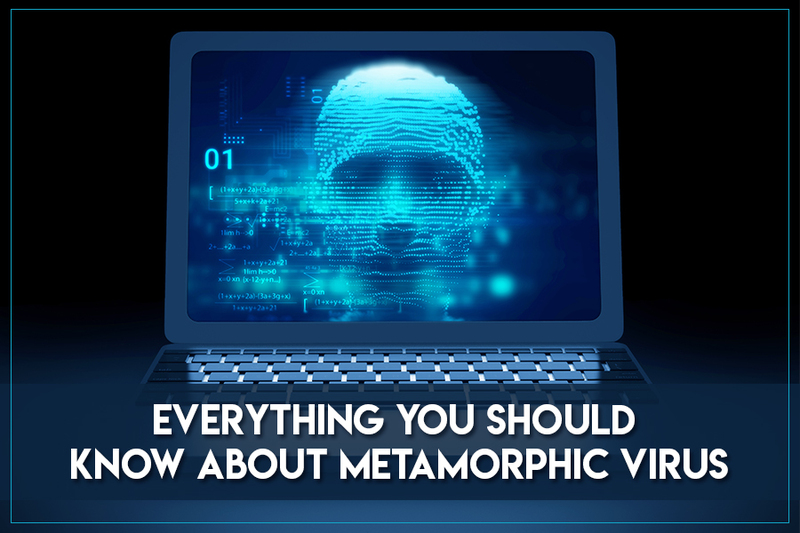 The moment metamorphic virus enters in your system, it focuses on making your machine vulnerable to cybercriminals. In fact, it has been observed that sometimes systems can crush or leave the user virtually feeble. The motive of cyber attackers to infect your system with metamorphic virus to steal your data at corporate levels, money laundering, resort to extortion, other types of fraud, sensitive information for the financial benefits by demanding ransom. How to Detect Metamorphic Virus? As this virus comes with a unique code which assigns different codes to the viruses within the shell that makes Metamorphic virus difficult to detect. This malware is generated among system administrators that means it can be detected. However, in order to identify the malware, there is a lot of research and hard work undertaken in universities and laboratories. In fact, the researchers and experts have given their majority of time to in the research to prevent the threat of the Metamorphic virus. First and foremost, the thing is not to allow remote access of your machine to anyone especially when they are not legitimate. If there is a dying need to give the remote access then you need to make sure all the vital files that carry the sensitive and financial information that should be stored in the cloud. There should be no physical access to your essential data. Make sure you have an effective antivirus software installed on your system. Update your machine and apps on the regular basis. Now, you know everything about metamorphic virus, how does it work, and how to detect metamorphic virus. So, make sure you run antimalware and antivirus software on your system to ensure your safety and security.